Environment Agency teams are out on the ground, ensuring flood defences are ready, rivers can flow freely and clearing trash screens. The Environment Agency is reminding people that they can sign up for free flood warnings and check their flood risk on the GOV.UK website. There is a localised risk of river flooding during the rest of Friday in some parts of Kent and western Midlands as rivers respond to recent rainfall, with parts of the River Severn remaining high into the weekend. Heavy rain, with some snow, may affect south-east England from Saturday night into Sunday and this also brings a potential risk of flooding. This could bring localised disruption to travel and potential flooding of some land, roads and individual properties. The Environment Agency is urging people to take care, avoid driving through flood water and avoid putting themselves or others at risk. Rivers in western parts of the Midlands and Kent are continuing to respond to recent rainfall, with parts of the River Severn remaining high into the weekend. We are continuing to monitor the situation closely, along with the Met Office and local authorities. 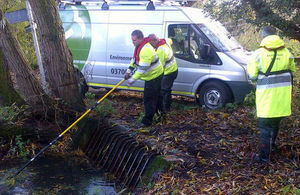 Our teams are out on the ground, ensuring flood defences are ready and rivers can flow freely and clearing trash screens. People can sign up to receive our free flood warnings, check their flood risk and keep up to date with the latest situation here or by following @EnvAgency and #floodaware on Twitter for the latest flood updates.